Here is a sample of some of the famous musical stars known to have Hatfield connections or just played in the town. Hatfield Philharmonic Orchestra (now called the The Philharmonic at UH / de Havilland Philharmonic) – founded in 1969, and has performed in concerts at the Royal Festival Hall, Southbank, London. Regularly performs at the Weston Auditorium, de Havilland Campus, Hatfield. Hatfield Philharmonic Chorus – vocal group supporting the Hatfield Philharmonic Orchestra. Alfredo Campoli – Italian violin virtuoso played at The Forum (Lemsford Road – demolished in 2000) in Hatfield, along with the Hatfield Philharmonic in 1979. UHRecordings – University of Hertfordshire record label. Founded in 2006 by Howard Burrell, Emeritus Professor of Music (retired 2005) and composer. His symphony 'Anniversary, Fanfare, Variations and Finale', was premiered by the de Havilland Philharmonic Orchestra at the Weston Auditorium, Hatfield, on 11 October 2009. 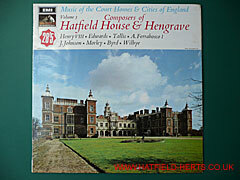 Composers of Hatfield House & Hengrave Hall – Volume 5 in EMI's Music of the Court Homes & Cities of England series of records (sleeve shown above). Released in 1968, it features Tudor musical compositions. Includes: Pastime with Good Company by King Henry VIII (said to be his most famous work – Greensleeves is often wrongly credited to him); and works by other composers like Richard Evans (c.1523-1566); Thomas Tallis (c.1505-1585); Alfonso Ferrabosco I (1543-1588); Thomas Morley (1557-1603); John Johnson (?-1594); and William Byrd (1543-1623). Sir Tim Rice – achieved international recognition as lyricist working with Andrew Lloyd Webber on Joesph and the Technicolour Dreamcoat, Jesus Christ Superstar and Evita. Later work included the Disney film The Lion King; the musical Chess, in partnership with the Abba songwriting duo; and he worked with Sir Elton John on The Lion King musical and Aida. Sir Tim's parents worked for a while at de Havilland headquarters in Hatfield. As a youth he spent two summers working as a petrol station attendant in Hatfield. The Police – reportedly made their first public performance of Message in a Bottle in 1979 at the then Hatfield Polytechnic. Donovan – born in Scotland but grew up in Hatfield. One of the first folk-rock stars, he had seven UK Top 10 hits between 1965-68. Reportedly taught John Lennon and Paul McCartney various guitar finger-picking styles. In January 2009, was made an Officer of the Order of the Arts and Letters by the French Culture Minister. Mick Taylor – born in Welwyn Garden City but grew up in Hatfield. Replaced Rolling Stones' guitarist Brian Jones in 1969 and was influential on their 1971 Sticky Fingers album. In 1989, along with the Rolling Stones, was inducted into the Rock and Roll Hall of Fame. Paul Griggs – member of 70's group Guys and Dolls (played alongside Frank Sinatra and two of the group went on to form Dollar) hails from Hatfield, where his father worked at de Havillands. He formed a band The Cortinas with Roger Cook and they played their first gig at Onslow School in Hatfield (the school's site at that time has since been demolished). Barbara Gaskin – born and raised in Hatfield. Moved to Canterbury in 1969. Was a vocalist with the band Spirogyra and later guested with Dave Stewart's band Hatfield and the North. In 1981, Barbara and Dave had a No.1 hit together with their version of It's My Party. Alan Shacklock – formed his first group The Juniors in Hatfield in 1963 with Mick Taylor, John Glascock and Brian Glascock. Graduated from the Royal Academy of Music in 1971. As a producer has worked with stars like Roger Daltrey, Meatloaf, Bonnie Tyler and Andrew Lloyd Webber. As a composer won the EMI Songwriter of the Year award. Sir Elton John topped the bill at the first Magic Summer Live festival held in the grounds of Hatfield House on Sunday, 17 July 2011. Among the other acts were Lighthouse Family, The Pierces, and Rumer. Johnny Depp – the Hollywood actor directed a music video using actors for 'Unloveable' by Babybird (best known for 'Your Gorgeous') in the grounds of Hatfield House in September 2009. Unfortunately, the hanging sequence was deemed to graphic by TV companies but it can be seen on the internet.